I had a very interesting week. I attended Digital Book World, which has moved from New York to Nashville. You know me, I’m curious—about the industry, about bookselling in the digital age, about ways to connect with bookstores and readers, and how the digital revolution affects them long term. I love that the book market is no longer only about the front list, and that backlist rejuvenation is bringing many authors’s careers back to life. I love that discoverability is in the hands of the consumer, and I LOVE that I can walk into a bookstore and ask the bookseller for a personalized recommendation. But there is no denying ours is a changing industry. I wish I could say I had a solid idea where we’re headed, but if anything, I’m even murkier about that. Some of the storytelling AI initiatives are astounding. Metadata is more than a buzzword; it’s a necessity to break out. One thing is for certain — storytelling, in all its forms, isn’t going away. So I’m going to keep my head down, write my books, and see where things go. Since I’m playing catch up, let’s take a look at the latest and greatest links! How to Build Routines That Conserve BrainPower For High-Level Thinking. I'm building a lot of routines this fall. I have had a rough 18 months and I’m ready for some habits. V.E. Schwab: Exploring Philosophical and Moral Dilemmas. I liked this because I think villains are the unsung heroes of fiction. Without a good villain, stories fall short for me. What Personality Tests Really Deliver. This is rather fascinating. I am an INTJ, and I embody those personality traits so intensely that the idea that they might not be real bothers me. I am also a Taurus, and I spent my teen years trying to divine the personalities of people around me using Linda Goodman’s Sun Signs. So science, or astrology, regardless, we are all unique in our ways. How "comfort dogs" are improving behavior in New York City classrooms. I loved this. We all know how great animals make us feel. 2018 Fall/Winter Reading List. So honored to see TEAR ME APART included on Deep South Magazine’s list, alongside some incredible other favorites, like PCH’s Becoming Mrs. Lewis! Organized Chaos: An Interview with Jeff VanderMeer. Organized Chaos is pretty much the theme song for my life. Also, it’s a great band name. 12 Yin Yoga Poses to Awaken Dormant Energy and Recharge Your Practice. We can all use some yin today! There is nothing better than getting into that fascia and helping it open. Breathe, peeps. Namaste! An Idyllic Artists’ Retreat that Invites Guests to Take in the View. Yes, please. I would ship off here in a heartbeat. The Useless Days Will Add Up to Something. This is really good advice. Just keep plugging away. Even if your fingers aren’t on the pen or keyboard, you can be working. Looking Back To Go Forward: Lafite-Rothschild 1868 – 2015. I love Vinous for learning about wine. A fabulous site for those of you interested in the divine grape. 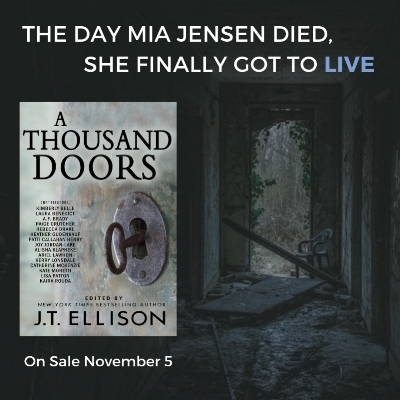 We’re gearing up for the release of A THOUSAND DOORS next month! Have you preordered it yet? Bringing Mia to life are the following amazing writers: Kimberly Belle, Laura Benedict, A.F. Brady, Paige Crutcher, Rebecca Drake, Heather Gudenkauf, Patti Callahan Henry, Joy Jordan-Lake, Alisha Klapheke, Ariel Lawhon, Kerry Lonsdale, Catherine McKenzie, Kate Moretti, Lisa Patton, and Kaira Rouda. Two TEAR ME APART book tour events are right around the corner! I’ll be speaking at 10 am Saturday October 13 at the Southern Festival Of Books in the Nashville Public Library Banner Room. This is the best bookish event in Nashville and I’m thrilled to be a part of it again. Then October 15 I’ll be at the 9th Annual Bibliofeast Book & Author Dinner hosted by the National Women’s Book Association-Charlotte, NC chapter. I would love to see you there! That's all for now! Send me some of your good energy for the week ahead, because I have a ton on my plate. Then, kick some leaves, put out some fresh bird food, and I’ll see you next Sunday!